Proton lifts off from the Baikonur Cosmodrome Sept. 29 at 12:52 a.m. local time with AsiaSat-9. The Proton is a family of Russian rockets that have been in use since 1965. The expendable launch vehicle is commonly used to launch commercial and Russian government satellites. As of mid-2018, the rocket line has launched more than 400 times, with most of those launches being successful. Some of Proton's most famous launches include sending the core module of the Russian Mir space station into orbit in 1986, and taking into space the Zarya and Zvezda modules of the International Space Station in 1998 and 2000, respectively. In 2016, a Proton successfully launched the Trace Gas Orbiter component of the European-Russian ExoMars mission. Proton rockets have successfully lobbed other spacecraft to Venus and Mars, and parts of the Russian Salyut space station. Rockets are constructed at the Khrunichev State Research and Production Space Center plant in Moscow and launched from the Baikonur Cosmodrome in Kazakhstan. Stages: 2 to 4. The current Proton version uses nitrous oxide and dimethylhydrazine for all stages. Capacity: 50,000 lbs. (22.8 metric tons) to low Earth orbit and 14,000 lbs. (6.3 metric tons) to geostationary transfer orbit. The Proton rocket that launched the ExoMars 2016 spacecraft to Mars was raised into a vertical position at the launch pad at Baikonur, Kazakhstan, on March 11, 2016. The Proton was originally conceived as an intercontinental ballistic missile that was called the UR-500, but its purpose changed to launching space payloads during development, according to Encyclopedia Britannica. The first launch took place in July 1965 and since then, the rocket has achieved a more than 90 percent reliability rate. In the late 1960s and early 1970s, several missions to the moon and Mars, launched on Proton-K/D rockets, ended in launch failures. Proton rockets did, however, successfully launch several missions to the Salyut space station. The Zond 5 mission successfully carried tortoises and other creatures around the moon in September 1968, just months before the first humans orbited the moon during Apollo 8. Proton-K/D rockets also launched several Luna missions. Notable examples are the Luna 16 and Luna 17 missions in 1970. These 1970 missions included two landers and a rover that for decades, held a long-distance travel record for off-world exploration. A workhorse since 1965, recent versions of the Proton-M have been plagued with failures. See how Russia's Proton rocket works in this Space.com infographic. The Mars 2 and Mars 3 missions in 1971 (launched on Proton rockets) both arrived safely at the Red Planet and achieved most major objectives. More recently, however, the Mars 96 mission failed during a Proton launch in November 1996. In the mid-1970s, the Proton-K/D variant successfully carried several Venus missions into space. This included Veneras 9 and 10, whose lander components arrived safely on the surface in 1975, and Veneras 13 and 14, whose landers touched down in 1981. A Proton rocket also launched the core module of the Soviet Union's Mir space station in 1986; Mir remained operational for many years. After exceeding its design lifetime (including operating with mechanical issues and after a dangerous fire), Mir was deliberately deorbited in March 2001. The Proton rocket line expanded to commercial business in the 1990s, with its first contract for the Inmarsat communications satellite in 1993; its first commercial payload was launched in 1996, according to Russian Space Web. Proton also assisted in the construction of the International Space Station by launching the Zarya and Zvezda modules in 1998 and 2000, respectively. In its Briz-M launch configuration, the Proton has a restartable upper stage and works with all major commercial spacecraft platforms, according to International Launch Services. ILS markets commercial Proton launches as a joint venture between Khrunichev and the Russian firm RSC Energia. Since 2010, Protons have launched dozens of communications and navigation satellites, with a few failures along the way – mainly in Briz-M upper stages. In August 2012, during the Telkom 3 mission, the Briz-M upper stage failed. More problems with a Briz-M caused a partial failure of a December 2012 mission, although the satellite was able to move into its intended orbit. Other Briz-M failures occurred during missions in May 2014 and May 2015. 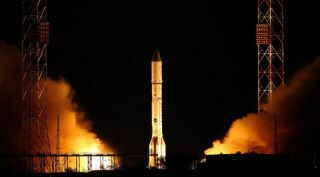 A Proton-M launching several navigation satellites crashed near the launch pad on July 2, 2013, which marked the only first-stage failure in the past 30 years. The cause was linked to a rate gyro package being installed upside-down. A Proton rocket successfully sent the ExoMars Trace Gas Orbiter (along with the Schiaparelli test lander) into space on March 14, 2016. The TGO reached Mars safely and successfully began its mission, but Schiaparelli failed during landing.